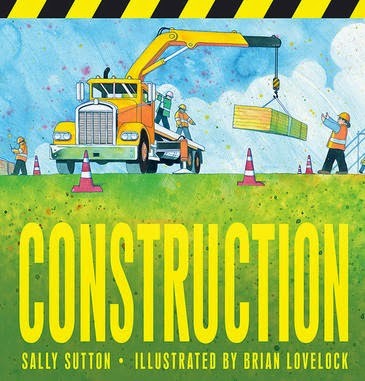 Follow the step-by-step construction of a building, with Construction, a new title from Sally Sutton and Brian Lovelock whose previous books with a similar theme include Demolition and Roadworks. Big machines dig, pour concrete and lift heavy loads. Workmen cut wood, hammer and create a frame for the building. Then pipes are laid and electrical wiring run throughout. What comes next? Painting and furniture, of course. It’s at this point in the story that you discover what the building is, and it’s the perfect surprise for readers - a library! Simple, but realistic illustrations use varied perspectives and provide an easy to understand look at the ins and outs this type of undertaking involves. They are sure to please children who love trucks and big machines. Construction makes clever use of language, with a steadily repeated pattern throughout, and each scene features onomatopoeia tailored to the situation, sounds like hammers going Bing! Bang! Bong! and the pouring of cement going Sloosh! Slosh! Slop! Right at the end of the book is also a page explaining what each of the machines are and exactly what they are used for. This is a story that’s lots of fun for little builders in the making.